Shortcodes are issued on a country by country basis. As a result, our shortcodes - 345345 & 444999 - only work with US based phone carriers. Please note: Canada support is only available for keywords created on the 345345 shortcode. In order to have your keyword work in Canada, you will need to add an international number to it. 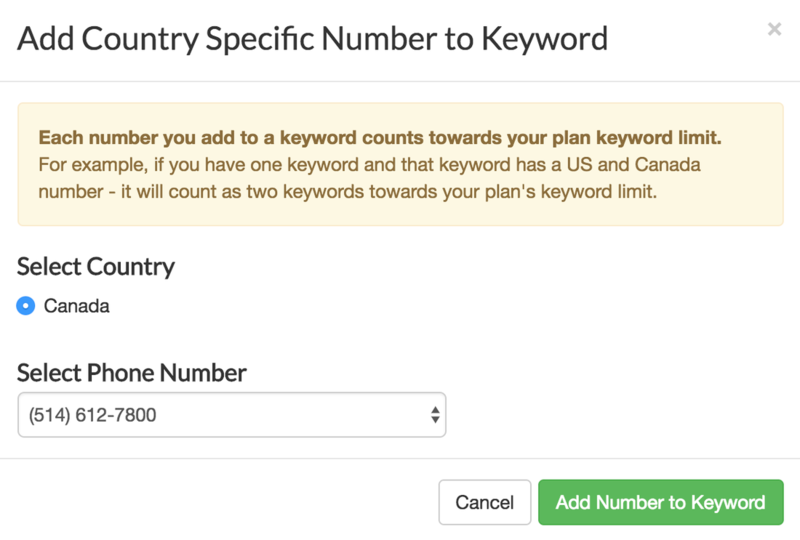 This will allow your Canadian users to text your keyword to a 10-digit Canada based number to enroll in your keyword. To add a Canadian number to your keyword, first click the "Add an International Number" button in Step 1 of your keyword options page. Next, choose your preferred Canadian number from the dropdown list & click "Add Number to Keyword". Canadian users can now text your keyword to the selected number to enroll in your keyword! Please note: Textiful currently only supports Canada based international numbers.